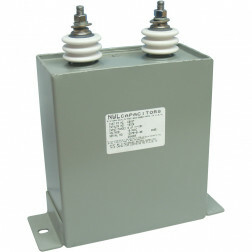 28F2025G-11-3, TKM207, 28F2026, P47729 Capacitor, Heavy Duty Filter, 8 mfd 7kvdc 10%, Sprague, 160-1253 1uf 15kvdc Oil Filled Capacitor, Del Elec, P0705004Y21 Oil Filled Capacitor, 4uf 5000vdc, Aerovox (C703), 6DC8-6.25 OIl Filled Capacitor, 6.25 MFD 8000 wvdc, Weight 11.05 lbs., Sangamo, 28F2025G11 Oil Filled Capacitor, 7.1uf 5kv, GE , C0167 Capacitor, oil filled, 6 uf 10 kv usamfg: nwl, LK75-500ND OIl Filled Capacitor, 5 MFD 7500 wvdc, Weight 8.85 lbs. 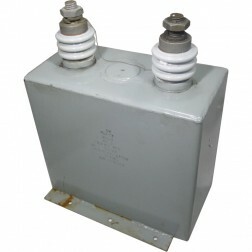 H83R665 54uf 660 ovac aerovox 4 5/8 x 2 5/8 x 8, Weight 5 lbs. 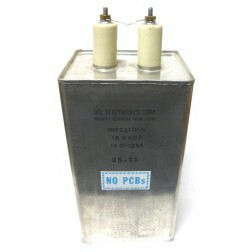 160-1253 1uf 15kvdc Oil Filled Capacitor (25-75), MFR: Del Electronics Corp.
LK75-500ND OIl Filled Capacitor, 5 MFD 7500 wvdc, Weight 8.85 lbs. 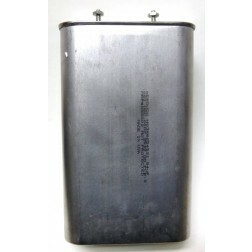 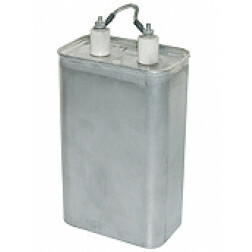 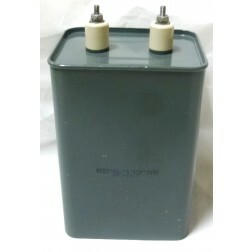 LK75-500ND 5 MFD 7500 wvdc, Oil Filled Capacitor, MFR: Plastic Capacitor Inc.